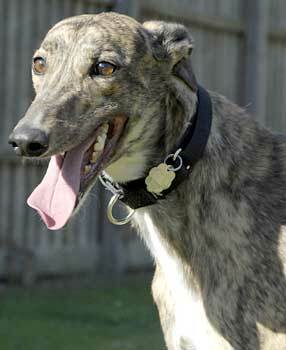 DeeDee, aka A's Dusty Dog, is a cute-as-a-bug 2-year-old brindle girl, born on July 23, 2004. DeeDee's sire is Be Discrete, an esteemed racer holding multiple titles, and her dam is LR's Sizzler, another successful racer. But someone forgot to tell DeeDee about her heritage, because all she wants to do is smile and play. 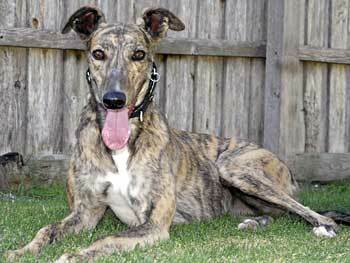 After 12 races, DeeDee left racing and is now in pursuit of her forever home. The life of the party, DeeDee is a hit with humans and other Greyhounds, but it remains to be seen if small dogs can be included on her guest list. You'd better not invite cats to DeeDee's party. She'll spend her time pursuing the cats and not attending to her other guests. Cute-as-a-bug *defines* this girl! From the moment she stepped through the door of our house she began following us around like our little furry shadow. She always wants to be where her humans are, for attention or to just lay quietly at their feet. She is a lap-dog at heart for sure, and will crawl up in the seat with you if you let her. She has not had one accident in the house since arriving, and is crated during the day when we're gone. She sleeps quietly all night long on a dog bed in her foster parents' bedroom along with her furry foster siblings. She gets along with every dog she's been introduced to, but it's not known if she is cat or small animal tolerant. She has yet to exhibit much of a prey drive, very often wondering why her canine companions have any interest in the ever-present harrassing squirrel. If you give little DeeDee a chance, she'll find her way into your heart very quickly!